…The entire album stands for its relaxed mood, balance between the music’s foreground and background, cohesion in the musicans’ aims. Roberto Paviglianiti, Italian magazine “Suono”, 2011. 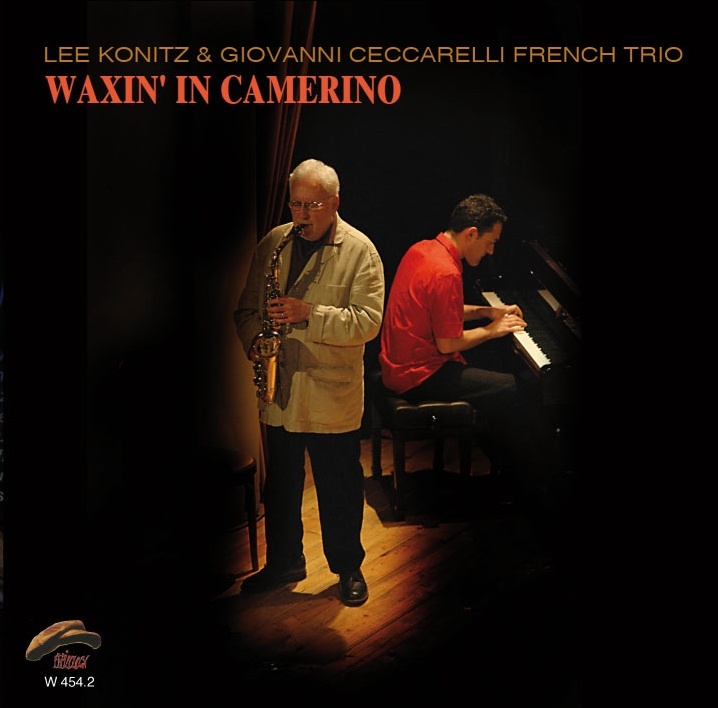 (Lee Konitz and the Giovanni Ceccarelli’s French Trio) through their experience and creativity released a record which does not sound like the usual standards’ records. As a matter of fact it a very fresh CD, where the musicians give new renditions of classics like “On Green Dolphin Street” and “Long Ago and Far Away” without turning them upside down: a task which a few artists succeed in. Claudio Cavallaro, Italian website “Livecity”, 2011. “Waxin’ in Camerino”… contains eight standards which have been performed with an absolutely original and contemporary kind of expression. This music is far from us in time, but it is indeed close to us emotionally. Matteo Mosca, Italian website “Jazzitalia”, 2011. The titletrack, composed by Konitz and Ceccarelli, (is) one of the album’s highlights; this record stands out as a whole for its rather high level. Alberto Bazzurro, Italian website “All About Jazz”, 2011. “Waxin’ in Camerino” is a collection of known standards whose rendition is not based, as usually is, on a re-interpretation of the songs’ harmonies. As a matter of fact, such interpretations spring from variations of the melody, tone and dynamics: the songs thus are brought to a new life. (Giovanni Ceccarelli’s) French Trio is a tight group whose playing is quite effective and sparse. Konitz is at ease with these musicians, and we can hear it from the music. Flavio Caprera, Italian website “Jazz Convention”, 2011. (“Waxin’ in Camerino”) is a summary of the pianist’s creative talent and technique, showing not even the slightest tendency for self-reference. Pietro Scaramuzzo, Italian website “Extra Music Magazine”, 2011. Andrea Del Castello, Italian website “Musicalnews”, 2011. (The) great Konitz… is supported by Ceccarelli’s modern and expressive pianism; in addition, (the Italian musician) explores new sounds. (Ceccarelli’s) solos are always well balanced and creative, expressing delicacy and tenacity, sweetness and determination. Italian website “La Repubblica News”, 2011. Gian Mario Maletto, Italian magazine “Musica Jazz”, 2011. Pietro Scaramuzzo talks with Giovanni Ceccarelli about CDs “Waxin’ in Camerino” and “Daydreamin'”.